Baltic Amber For Pain Relief. Ways to relieve pain naturally. For many centuries, man looked to gemstones, crystals, and other "mystical" substances to provide all sorts of remedies from preventing illnesses to bringing us good luck to thwarting evil spirits. In the world of modern science, however, we have been able to separate the "myths" from the facts. What makes it even more interesting is that the legend that became a reality existed millions of years ago and is respected today as one of the most amazing "gems" that ever lived ... Baltic Amber. Here, you're not only going to get a history lesson but you're going to be impressed with a phenomenon. Baltic Amber began it's life in Ancient Times when giant pine trees shed their resin which then joined with the earth and gradually migrated in the soil to the sea carrying along with it tiny fragments of insects and plant life. Never a "gem", Baltic Amber has always been considered a Fossilized Resin with some amazing capabilities. Pain relief is one of the main reasons people use Amber. Though the resin itself isn't a painkiller, its Succinic Acid is believed to have analgesic properties that take the edge off of pain. Baltic Amber contains 3-8% of Succinic Acid. The highest content of the acid is found in the Amber cortex, the external layer of the stone. 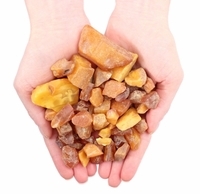 Amber has been used to alleviate all types of pain, from mild to severe. There are so many ways in which you can benefit from Baltic Amber. Some think of amber as a powerful "chakra"... a cleanser and healer. Others give testimony to the fact that wearing Amber Necklace provides amazing pain relief for head, neck and throat areas, most especially for congestion. Amber Bracelets are used to help control and alleviate pain of rheumatism, arthritis, and aching muscles and joints. Amber may even restore energy, strengthen the immune system and promote general wellness. Of course scientists debunked the idea that healing powers could come from such a humble source. That is until they spent years researching and discovered the little creatures inside the Amber were, in fact, millions of years old. So if that were the case, and Baltic Amber survived all those years until now - then it certainly could be "true" magic and then some. Unfortunately the quantity of Baltic Amber is become more and more scarce. It will become even more valuable as a result, especially for the millions of people around the world who use it for it's widely varied healing abilities. If you haven't explored what natural natural Amber can do, it's time you did. Amber Artisans have created some exceptional Amber Jewelry for Healing so that everyone from children to adults and to the golden generation can benefit in ways they never imagined. Perhaps you'll be one of them.